How to use the Aaronia RSA (with EMF-Monitor software) / SNDK with the National Instrument LabView. 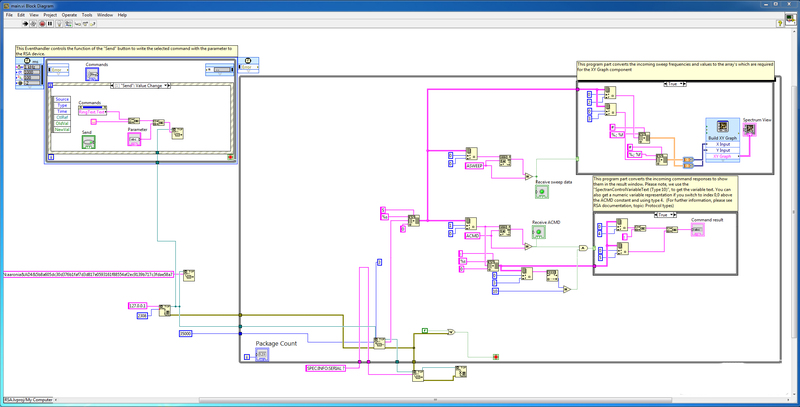 Here you can find a NI LabView demo project. This solution connects to a RSA/SNDK device and reads the incoming TCP/IP data packages. The project is a very simple demo without any optimizations and it doesn't support all functionalities of the RSA. It can be used as an example to prepare a connection to the remote device. - install the NI LabView software. - open the RSA.lvproj file in the LabView software. The project file has a default IP / Port configuration. Please make sure that your RSA device is running on these settings. If you are using an other IP configuration, you have the possibility to change the settings in the LabView project. You can find a description in the RSAv2-LabView.pdf documentation located in the project archive. Please note that we can't give any support in using the LabView software!